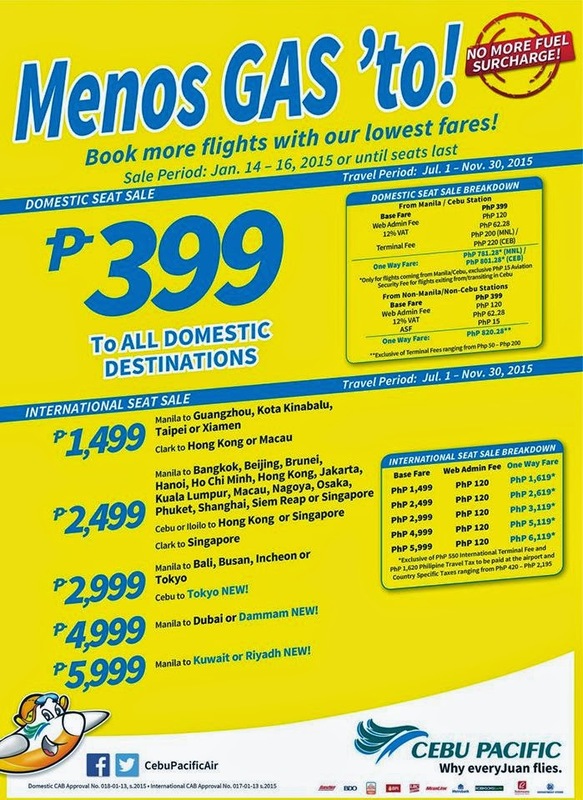 Piso Fare 2019 Promos Until 2020: No Fuel Surcharge Promo By Cebu Pacific 2015! No Fuel Surcharge Promo By Cebu Pacific 2015! Piso Fare Promo: You can travel to Caticlan (Boracay) from Manila with only P399 as your BASE FARE! Cebu Pacific will no longer charge you with Fuel Surcharge! So this is an exciting news for all travelers. Just mind the travel dates of this current promo from Cebu Pacific. This is open to all domestic destinations. Check below some of the international flights. #‎CEBseatSale‬. *Only for flights coming from Manila/Cebu, Exclusive of Php 15 Aviation Security Fee for flights exiting from/transiting in Cebu. All-in Manila to Sydney fare is one way, inclusive of base fare, Web Admin Fee, Australia Airport Passenger charges and 7 kg hand-carry baggage allowance but exclusive of Php 550 Terminal Fee, Php 1,620 Philippine Travel Tax to be paid at the airport upon departure from Manila and checked-in luggage. Quoted DOMESTIC one way fares are inclusive of Base Fare, Php 120 Web Admin Fee, 12% VAT, Php 200 and Php 220 Terminal Fees for flights transiting in/exiting from Manila and Cebu, respectively, and 7 kg hand-carry baggage allowance, but exclusive of Php 15 Aviation Security Fee for flights coming from Cebu and check–in baggage. Terminal Fees ranging from Php 50 - Php 200 for flights originating from non-Manila/non-Cebu Stations must be paid at the airport. Quoted INTERNATIONAL one way fares are inclusive of Base Fare, Php 120 Web Admin Fee and 7 kg hand-carry baggage allowance but exclusive of Php 550 Terminal Fee, Php 1,620 Philippine Travel Tax, Country-Specific Taxes ranging from Php 420 – Php 2,195 and check-in baggage. Promo fares have limited availability and are non-refundable but rebookable subject to the following rebooking fees: PhP 1,200 for Domestic destinations, Php 2,000 for Shorthaul International destinations and Php 2,500 for Long-haul International destinations plus fare difference. Please note that booking fee rates range from Php 120 – Php 200 depending on purchase channel. For your convenience, flight changes, availing of prepaid baggage allowance for check-in baggage and web check-in service can be done up to 4 hours before scheduled flight. The following routes may only be availed online through www.cebupacificair.com: ALL INTERNATIONAL except China and Long haul destinations, ALL Manila and Cebu to Boracay, Davao, Puerto Princesa and v.v. wala po ba kayong promo travel this april form manila to zamboanga or dipolog?